Trade union Saftu-KZN is calling on the youth to ‘remember they are the majority, with great power in their hands’ come the 2019 elections. The Ramaphosa government must release the incarcerated #FeesMustFall student leaders or face the wrath of the youth in the 2019 elections. 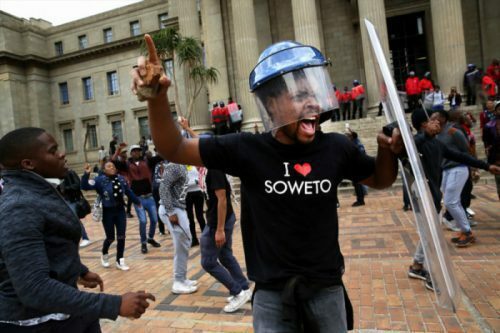 This was the view of the South African Federation of Trade Union (Saftu), which expressed its support for the student activists who had been charged in connection with the nationwide protests at tertiary institutions when students demanded free education at various campuses in 2016 and early 2017. Free education has since been declared by the government but some of the student leaders who led the campaign faced criminal charges in various courts in connection with the violence, damage to property and arson that ensued during the strikes. He said any prosecution of students was tantamount to betrayal of the will of the people as in the Freedom Charter and the constitution. Mautsoe said the Ramaphosa administration in continuing to kept the students in jail, was walking out of the contract signed by the working class in relation to education in 1955 when the charter was launched. “The Ramaphosa government must prove to South African people that it still stands by that contract or commitment by withdrawing all charges against the students who are being prosecuted by his administration. These young students have not killed anyone, unlike many who murdered 34 workers in Marikana but still walk free. These student never stole any billions which has been witnessed in various parastatals and government institutions. The funding crisis at the National Student Financial Aid Scheme (Nsfas) had proved that indeed there was a legitimate problem within higher education in the country. This was symbolised by widespread nepotism within Nsfas, fraud and mismanagement of student funding and non-payments of student fees for at least the last four years. This fact that was confirmed by Higher Education Minister Naledi Pandor, hence she suspended new funding applications for 2019. Mautsoe said the introduction of free higher education by former President Jacob Zuma was a vindication of the students’ struggle for free education. He said Zuma responded to the students’ demands – emphasising that what the students stood for was correct and lawful. The trade unionist condemned the arrest of a few when the majority of students participated in the actions. “Therefore the selection of these students smell like serious purging, vendetta, and political prosecution,” he said. “We therefore as Saftu–KZN call on President Ramaphosa to prove his objectivity by heeding the call made by these poor students and give them presidential amnesty, and set up a commission of enquiry into the issues related to fees must fall,” Mautsoe said. “If the government does not drop the charges against these young leaders and heroes of our life time….. history will judge the ANC government very harshly,” he said.